What are the round holes I discovered in some imported wood furniture? It is possible that these holes were made by a wood-infesting insect. There are a number of these insects, particularly beetles that can damage wood furniture. Eggs laid in wood by adult insects develop into a larval stage that can live in the wood for a long period of time, when the mature adult emerges an oval or round exit hole is found in the wood. We can inspect or identify the pest and recommend a control strategy to protect from further insect damage to your furniture. Options include treating the furniture or tenting the furniture and let the sun increase the temperature inside to kill the beetles. However, this heat treatment may harm painted or varnished surfaces of the furniture. How concerned should I be about powder post beetles in my home? The short answer is "very concerned". Powderpost beetles are members of a larger family of wood-boring beetles. This group includes those that infest living, dying and dead trees, and those that attack wood before and after it has been milled, finished, and installed in structures or made into furniture. 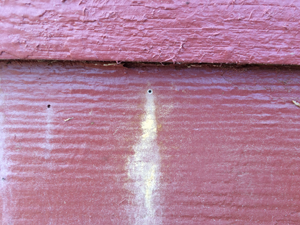 Damage caused by the adults or larvae range from unsightly holes in wood up to the greater damage of reducing the structural integrity of timber. Homeowners become alarmed when powderpost beetles unexpectedly emerge from wood in a new structure, from imported, furniture, firewood and even wooden art objects. The most important wood infesting beetles are the lyctidae, anobiidae, and bostrichidae beetles all more commonly known as powderpost beetles. These beetles are reddish brown in color and range in size from 1/32 to ¼ inch in length. True powderpost beetles or lyctids produce very fine powdery shavings or "frass" that is the consistency of talc and is much finer in feel to the frass produced by other types of powder post beetles. Frass is the combination of chewed wood fragments and waste. Active infestations are typically found in late winter through early summer and can be identified by frass hanging from exit holes or the accumulation of small piles on the surface below. These exit holes are typically very small, ranging in size from 1/32 to 1/16 inch. To properly identify the type of beetle damage the Enviroguard technician must examine the exit holes, the frass and the feeding marks found in the galleries inside the wood. These inspections are critical since adults or larvae are not always available for identification when the infestation is first discovered. Lyctids only attack the sapwood of hardwoods including oak, ash, or pecan. Moisture content in the wood plays a major role in the development of lyctid powderpost beetles. Activity usually occurs when the moisture content in the wood ranges from ten to 20 percent. Lyctids do not attack green wood where the moisture content is usually greater than 30%. Starch content in wood is another factor determining their presence. Since they do not have the ability to digest cellulose like termites do, beetles survive on starch, sugars, and proteins that naturally occur in the wood. The amounts of these wood nutrients directly match the development of this beetle. As wood ages and dries out, these nutrients decline and as a result wood that is over ten years old is rarely attacked. The control of this pest involves a comprehensive, thorough inspection of the structure by trained Enviroguard professionals who will identify the pest, determine the extent of the infestation and design an Integrated Pest Management (IPM) program. The program may include installing additional foundation ventilation and plastic ground cover for moisture control, removal of infested wood if practical, and treatment of infested areas based on the extent of the infestation and type of powderpost beetle identified. Any program must include follow-up inspections to assess the effectiveness of the control plan. It is important to note that exit holes and frass may continue to appear, even after a control program is in place. Over time, this activity should decrease and finally cease. 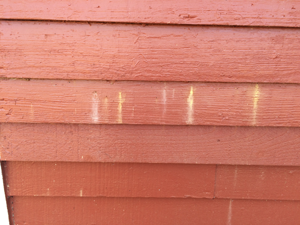 Read about Enviroguard's work treating powder post beetles at historic Prater's Mill.